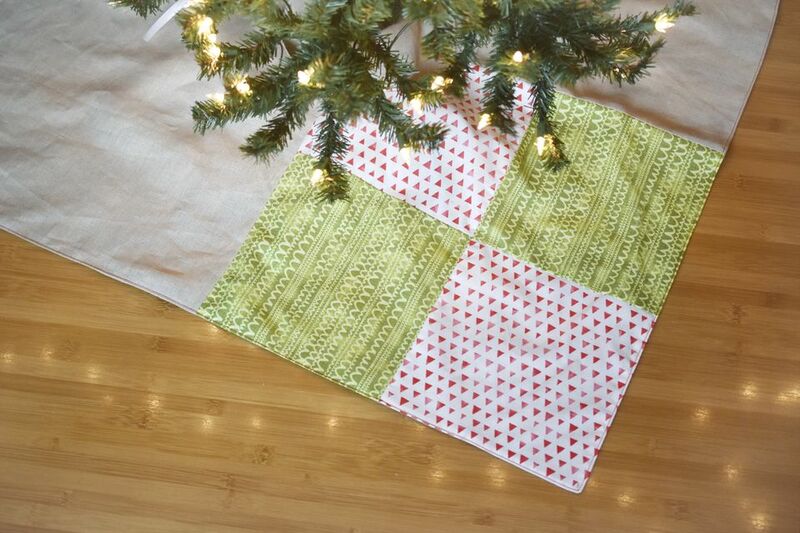 A handmade Christmas tree skirt doesn't have to be complicated. This square-shaped skirt has patchwork panels and larger areas that are perfect for customizing. It takes less than two hours to cut, pin, and sew! You can make this in red, green, and linen, or there's lots of room to adapt this design to your own tastes. For example, instead of the two large linen panels, make them as matching patchwork areas. Or, add embroidery to the linen to transform this quick project into an heirloom. The finished tree skirt measures just under 35" square, but it's easy to make it larger or smaller with a bit of simple math. Grab your favorite fabrics, a few sewing basics, and get started! You will need the following materials to create this project. *If you want to use narrower fabric, purchase 1-1/2 yards. **Because fabric cuts aren't always accurate, you may want to buy extra to make sure you have a full 9-inch cut. Cut one 35-1/2 inch square and two 17-1/2 inch squares from the linen. Cut four 9 inch squares each from the red and green fabrics. If you want to add extra embellishment to any of the panels, now is the time to do that. Embroidery or applique would both be charming on a tree skirt like this! 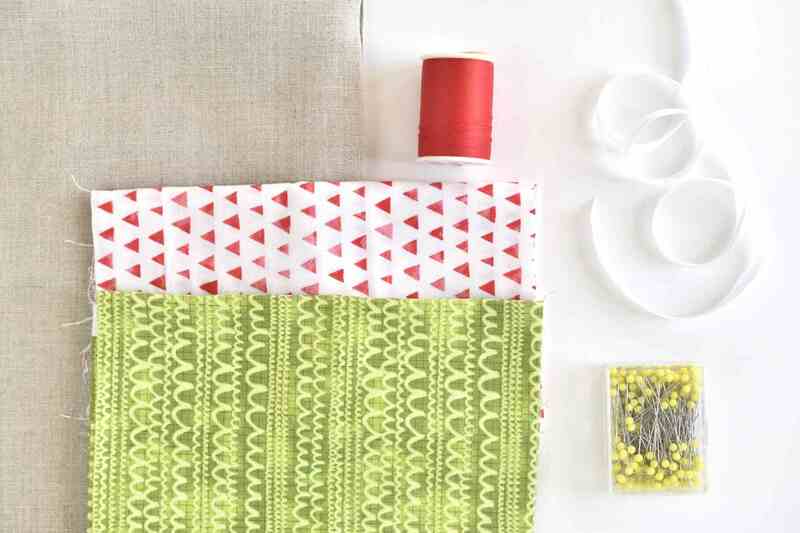 Lay out the red and green fabrics to make two 2x2 patchwork squares. If the fabrics are directional, pay attention to the placement. Pin sets of red and green squares together. Sew the small squares together with a 1/4 inch seam allowance. Press the seams open or to one side. Sew the sets together to form 2x2 squares. Press the seams. Pin and sew each linen square to a patchwork square. Pin and sew these two pieces halfway across. You should have a large square with a split from one edge to the center. Press the seams. Trim 1/4 inch from each side of the split. Place a small bowl or plate on the center of the tree skirt top. Trace around the dish with a pencil and then cut out the center using fabric scissors. Lay the tree skirt top on the large linen square. Use the top as a template to cut a slit and center opening in the tree skirt bottom. Cut the ribbon into four 12 inch pieces. Pin the top and bottom of the tree skirt with right sides together and with the ribbon sandwiched in between. The ribbons should be evenly spaced with two on each side of the split edges and with the ribbons on each side matching up. Sew around the entire shape, backstitching over the ribbons and leaving an opening for turning.​ Clip the corners and curves and turn the tree skirt right side out. Hand stitch the opening closed. Top stitch around the entire tree skirt with contrasting thread for an extra touch. Place the skirt under your Christmas tree and tie the ribbons to hold it in place. Add some wrapped presents and enjoy the holidays!